Ken Danby was 67. 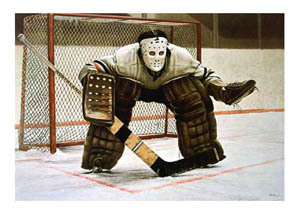 He was recognized as one of the world's foremost realist artists and is best-known in Canada for his iconic hockey painting, "At The Crease." Our co. reprinted a few of his paintings & I've met him a couple of times, most recently in 2001 or so. A true gentleman & was willing to sign this print (8 1/2" x 11" size) for anyome in our company that wanted one. He spent over an hr. signing for everyone & supplying the pic.